Daily Illuminator: Pinny Arcade Pins On Warehouse 23! 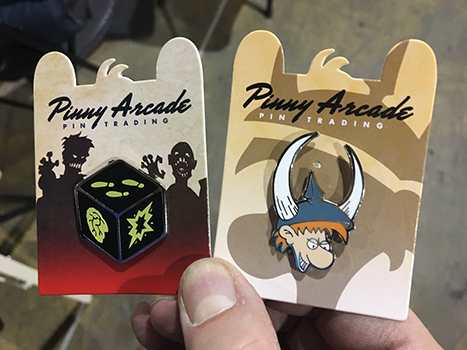 December 9, 2017: Pinny Arcade Pins On Warehouse 23! If you attended PAX Unplugged (and you really should, next year), you may have seen our new Zombie Dice and Spyke pins featured in the PAX Pinny Arcade Pin Quest pamphlet. A few came home with us, and now we're releasing them on Warehouse 23! These are limited-edition pins created for the event (essentially, a pin scavenger hunt). They feature the classic die from Zombie Dice and Spyke's head for Munchkin - two of our most popular games. The pins are high-quality, perfect for displaying on your favorite cork board, backpack, hat, or hoodie. Pick up these pins on Warehouse 23 to complete your Pin Quest, or just add these hard-to-find accessories to your SJ Games swag collection. And while you're there, check out our other pins, like Illuminati, Ogre, and Munchkin pins! Thanks so much to Penny Arcade for supporting us in making these pins, and for letting us be a part of Pin Quest. All of the PAX conventions are a blast; we're looking forward to PAX South in San Antonio, January 12-14!